Growing up, Cassie Carter and her sisters, Karen and Nichole, were incredibly close — until one fateful event drove them apart. After high school, Cassie ran away from home to marry the wrong man, throwing away a college scholarship and breaking her parents’ hearts. To make matters worse, Cassie had always been their father’s favorite — a sentiment that weighed heavily on her sisters and made Cassie’s actions even harder to bear. Now thirty-one, Cassie is back in Washington, living in Seattle with her daughter and hoping to leave her past behind. After ending a difficult marriage, Cassie is back on her own two feet, the pieces of her life slowly but surely coming together. Despite the strides Cassie’s made, she hasn’t been able to make peace with her sisters. Karen, the oldest, is a busy wife and mother, balancing her career with raising her two children. And Nichole, the youngest, is a stay-at-home mom whose husband indulges her every whim. Then one day, Cassie receives a letter from Karen, offering what Cassie thinks may be a chance to reconcile. And as Cassie opens herself up to new possibilities — making amends with her sisters, finding love once more — she realizes the power of compassion, and the promise of a fresh start. 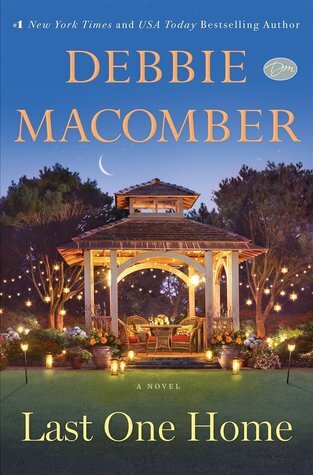 Last One Home by Debbie Macomber is a story about forgiveness, moving forward, and new beginnings. Central themes were focused on family, love, and second chances. The tale was both sad and sweet. A young woman made some bad mistakes and learned how to move beyond them. Cassie is strong, independent, and smart. I liked her personality. She felt both lost and deserted by her family when they too, felt the same way about her. Loss, grief, and hope were shown here, too. Cassie and her family might have a chance at redeeming themselves and being a family again. Overall, this women’s fiction novel was great.